With curls back in the hair fashion scene, women want the best curling iron that doesn’t damage their hair but still get the most value for their money. The Hot Tools curling iron carries most of the features of other similarly-manufactured curling tools at less cost and with more versatility for use on different hair types for longer-lasting curls. 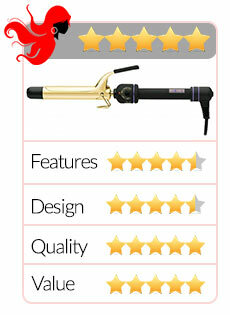 Even hairstylists use the Hot Tools curling iron for its flexible multi-levels of heat control. There’s a lot of credibility which goes with that when you consider how much a curling iron is used on a daily basis and on varying hair types. Shouldn’t you have the same curling iron used in professional salons by trained hairstylists? Like its other sibling, the Hot Tools spring iron curler, this particular model is reliable when it comes to performance because of numerous salient features, not the least of which is its power cord’s swivel capacity that goes hand in hand perfectly with its ten variable heat settings and powerful spring clamp. 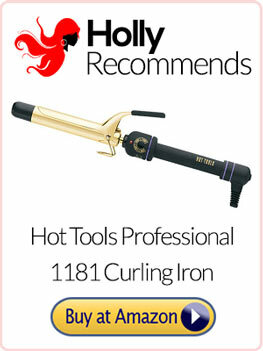 How well does the Hot Tools Professional 1181 Curling Iron with Multi-Heat Control measure up? Take a look at its plethora of features. Dimensions 5.6 inches by 2.4 inches by 2.4 inches. Maintains even and constant heat from low temperature to super hot even while hair is styled. Capable of heat up to 428°F. Handle has a soft grip for comfortable and secure handling. Jumbo barrel size is 24k gold plated. With a foldaway stand for safety. Thumb grip is extra long. Power cord comes with an improved swivel capacity for longer lasting cord life. With ten variable settings for heat levels. High performance from exclusive Gets Hot… Stays Hot™ mechanism. Comes with a bonus of two additional replaceable springs. On and off switches are separate to allow the rheostat control to memorize preferred heat settings. Barrel’s cool tip is extra long for added safety to hands and fingers while styling hair. Power cord is heavy duty at 8 feet. Has a high performance spring clamp. Heat is what makes hair curl and the quality it dispenses is what makes a curling iron’s performance optimal. The Hot Tools professional curling iron with multi-heat control has ten variable heat settings for the kind of temperature different curls require. You can create loose curls and waves, and even ringlets, with its jumbo barrel. This Hot Tools 1 inch curling iron model has a tip at its end that’s long enough to hold hair and curl it at a maximum degree (between 350°F and 428°F) and, unlike other hair curling tools, you won’t have to wear heat-resistant gloves that can burns to your fingers and hands because of this extra-long end tip advantage. Speaking of burning, the Hot Tools Professional 1181 Curling Iron with Multi-Heat Control will not “fry” your hair like other curling irons are sometimes wont to do. The long power cord makes it convenient for you to plug it into a floor-level socket. The cord’s length also allows you to use it while sitting down or standing up and the pivot on it prevents tangling, pulling or snagging your hair. A majority of customer reviewers have fallen in love with this particular Hot Tools model for the way it creates curls that hold until the next day. Some of the reviews even had suggestions on how to maximize the use of the Hot Tools Professional 1181 Curling Iron with Multi-Heat Control: smooth your hair by straightening it first and then curl it afterwards. 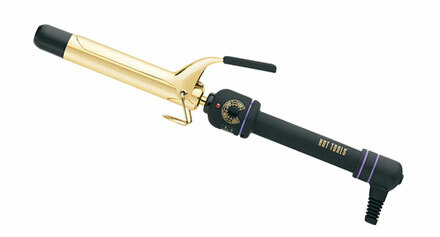 And who wouldn’t fall in love with this Hot Tools gold curling iron? It looks sleek and classy, two words that you wouldn’t otherwise use for a curling iron. In fact, you might actually find it hard to believe the price on the high performing Hot Tools Professional 1181 Curling Iron with Multi-Heat Control with its 24K gold plating on Amazon. According to numerous customers, the Hot Tools Professional 1181 Curling Iron with Multi-Heat Control performs so well that even hairstylists and hairdressers use it at their respective salons. This Hot Tools model doesn’t have an automatic shut off feature, unlike other curling irons. Although this feature is not really a requirement for a curling iron to be considered a good quality hairstyling tool, potential customers who tend to be forgetful will appreciate this feature when purchasing their new curling irons. Some customer reviewers experienced creases in their hair when this particular Hot Tools model gets extremely hot. This is because the clamp on its iron is a little bit on the heavy side. Other customers who experienced the same thing did suggest to just keep the curling iron moving when its temperature has been set to high heat. Out of 1,653 reviews, a remarkable number of 1,116 customers found the Hot Tools Professional 1181 Curling Iron with Multi-Heat Control satisfactory to give the product an Amazon rating of between 4.5 and 5 stars. It may not have an automatic shut off mechanism like most curling irons but don’t let that be the only basis why you should get another curling iron instead of this Hot Tools model. This product actually has more merits than it gets credit for; just go over its features and you will know why. This particular Hot Tools professional curling iron is, undoubtedly, one of the very few curling tools on the market today which can create a wide range of curls for all hair types, from loose, casual curls to glamorous waves fit for the red carpet. Get the Hot Tools 1181 at a Discounted Price on Amazon!